Liepāja, is a city in western Latvia, located on the Baltic Sea directly at 21°E. Your list of things to see and do now includes Venta Waterfall, The Riezupe Sand Caves, Edole Castle, and other attractions. Kick off your visit on the 4th (Thu): make a trip to Sculptures of Liepaja Anthem Characters, examine the collection at Museum of the Kuldiga Region, take in the spiritual surroundings of Edole Castle, Head underground at The Riezupe Sand Caves, then admire the sheer force of Venta Waterfall, and finally pause for some serene contemplation at St. Joseph's Cathedral. Here are some ideas for day two: take an in-depth tour of Liepājas muzejs, kick back and relax at Jurmalciems beach, steep yourself in history at Northern Forts, contemplate the long history of House of Peter, then take in the architecture and atmosphere at St. Anne’s Church, and finally appreciate the history behind Latvian Musicians’ Walk of Fame. To find more things to do, where to stay, and other tourist information, read Liepaja trip itinerery planner. Use the Route module to find suitable travel options from Kaunas, Lithuania to Liepaja. In August, plan for daily highs up to 26°C, and evening lows to 13°C. Wrap up your sightseeing on the 5th (Fri) early enough to drive to Ventspils. Ventspils is a town in northwestern Latvia in the historical Courland region of Latvia, and is the sixth largest city in the country. Your day-by-day itinerary now includes House of Crafts as well as Irbene Radio Astronomy Center. On the 6th (Sat), see the sky in a new way at Irbene Radio Astronomy Center, enjoy the sand and surf at Ventspils Beach, and then examine the collection at House of Crafts. On the 7th (Sun), you'll have a packed day of sightseeing: examine the collection at Ventspils Museum, let little ones run wild at Ventspils Children’s Town, and then examine the collection at Ventspils Creativity House Planetarium and Observatory. To see where to stay, reviews, ratings, and more tourist information, read Ventspils vacation trip planner. Traveling by car from Liepaja to Ventspils takes 2 hours. Alternatively, you can take a bus. 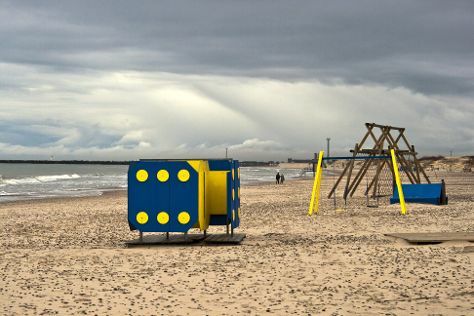 In August in Ventspils, expect temperatures between 26°C during the day and 13°C at night. Finish your sightseeing early on the 7th (Sun) so you can travel back home.